Hubby - "So Jill (his sister) says she's in for a goat and John (his cousin) is in for a couple of chickens. Oh and Steve (his friend) is in for a couple of chickens too." Me - "I'm sorry, what do you mean they're in for?" Hubby - "For the farm." Me - "Ohhhh right, the farm. Umm so these are like farm warming gifts? Ha ha ha"
Hubby - "Yeah something like that." 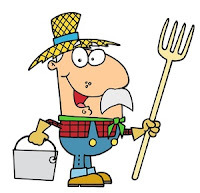 So tonight, while out to dinner with a Good friend (here after referred to as Instigator), Hubby brings up the farm idea again and I'm beginning to fear that this is becoming more than a funny anecdote. The story begins with Hubby extolling the virtues of the tractor he saw. When Instigator wasn't getting the picture of it, I said "you know like the tractor he rides at the beginning of Green Acres." "Ahhhh" Instigator said. "Now I get it." Instigator and Hubby spend next hour discussing the various types of crops, produce, items, etc their farm could be known for. There is a discussion of hydroponics (after clarifying to Instigator that this does not involve anything illegal), coffee and bananas (climate no good), eggs (you'll need a lot of chickens...free range chickens) and finally hops, barley, etc for beer. There was also a discussion of greenhouses and biospheres. Instigator - "Hey didn't the funding just run out for the biosphere out West? It's just sitting there idle right?" From there talk turned to the type of "uniform" they would be wearing. I believe they settled on Carhartt overalls, straw hats and plaid shirts. (My apologies to Instigator's girlfriend.) From there, the farm idea turned into a farm/bed and breakfast, with a landing strip that also had an airplane shuttle service to and from said bed and breakfast, with lake for jet skiing, and $1,000 omelets (made of course with the eggs from our chickens.....). As the conversation went further and further and Instigator continued to "encourage" farm fantasy, I commented that this was getting out of hand and I felt a little like Zaza Gabor getting dragged to the middle of the country.......to which they both just laughed. PS - Did I mention that the neighborhood we currently live in is called Green Acres? This one is the best by far! Love this one.....really like the storytelling banter back and forth. Just great! By the way, your "hubby" really does need to cut back on the coffee....too much energy to think of these things! Good Morning Zsa Zsa! Remind your husband that he will have to climb the pole to answer the phone, you will have to master the the plugs aka electricity in the kitchen and you will need a pet pig named Arnold Ziffle. But most of all, remind the love of your life that you are going on a shopping trip for some feather boas, glitzy diamonds, gowns and heels. Happy farming! My hubby and I were laughing so hard. Um, and he will probably be commenting later. Or calling to get in on the deal. Sorry "A"...but tell Jeff im in for hayrides!!! @ Apple - this was so the conversation for your hubby! I mean he already has the grains right? He could take care of growing the soybeans and alfalfa....how many chickens should I put you down for?